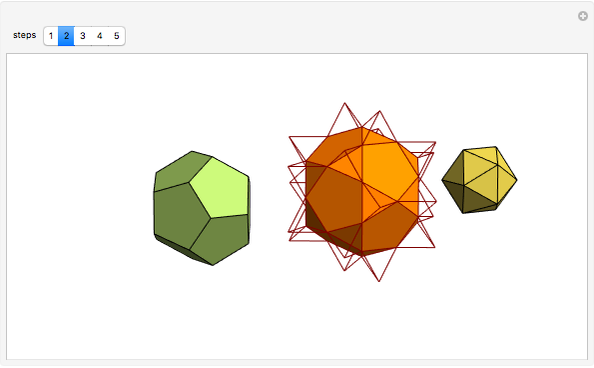 This Demonstration gives a dissection of a combination of an icosahedron, a dodecahedron, and an icosidodecahedron into a combination of a rhombic triacontahedron and a hexecontahedron. It was proved  that it is possible to dissect the icosahedron, dodecahedron, and icosidodecahedron into finitely many pieces that can be reassembled to form a large cube. The authors admit that they have no idea how to perform such a dissection. These solids can be dissected to form a rhombic triacontahedron and a hexecontahedron. The first can be dissected into 10 prolate and 10 oblate rhombohedra and the second into 20 prolate rhombohedra. These prisms can be dissected into pieces and reassembled into a cube. To get the hexecontahedron and the triacontahedron you must dissect the icosahedron into 20 pyramids and put them on the triangular faces of the icosidodecahedron, then excavate 12 pentagonal pyramids from the icosidodecahedron and put them on the dodecahedron. J. H. Conway, C. Radin, and L. Sadun, "On Angles Whose Squared Trigonometric Functions Are Rational," Discrete & Computational Geometry, 22(3), 1999 pp. 321–332. I. Hafner, "Paper Model Solution of Conway-Radin-Sadun Problem," Visual Mathematics, 9(2), 2007. 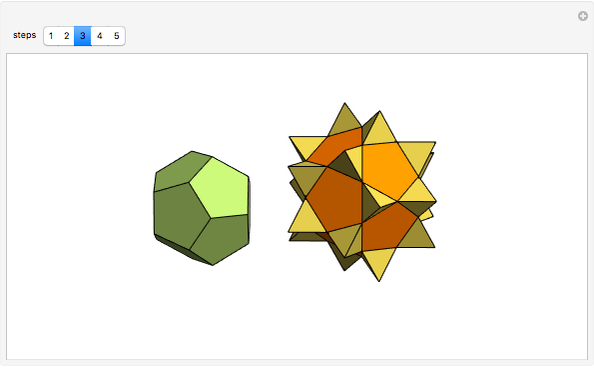 Izidor Hafner "Dissection of Three Polyhedra into Two"